I wasn’t initially going to do a post about this book because I only wanted to read it for my own amusement, just to see what all the hype is about. 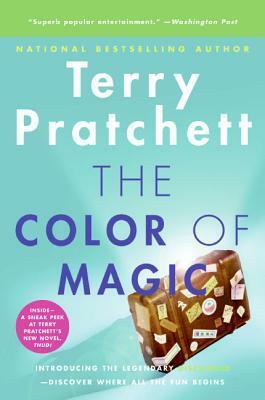 I had previously written about how Terry Pratchett should be respected for his achievements, and I still stand by that, even if I didn’t get as much enjoyment out of reading this first Discworld novel. I found it to be annoying and illogical (I think that was the point?). There was barely a plot, most of the middle section was just nonsense for the sake of nonsense. He’s created this crazy world, which I’m on board with, but it seemed as though he didn’t know what to do with it. Obviously, Pratchett has written a 40-odd book series and we can see that it’s been wildly successful, so maybe it’s the first book “curse,” so-to-speak, where the author has an idea and doesn’t fully know his strengths and weaknesses in order to execute it well. This was a similar criticism I had with Jim Butcher’s Dresden Files. Maybe if I had read this book when I was younger I would have liked it more just because it’s so totally random that as an adult I’ve lost my ability to appreciate it? Or my suspension of disbelief was only being told about Discworld rather than immersed in it? This also happened when I was reading the 2nd through 4th (couldn’t even get to the 5th) book of Douglas Adams’s Hitchhiker’s Guide (and Adams’ is an apt comparison in terms of world building). Overall, I was underwhelmed, but I have been encouraged through reviews of the 2nd book to continue reading at least the next book in the series. Sorry to the die-hard Pratchett fans, but don’t worry, I haven’t given up on him yet. I still have to read Good Omens!